A constant feature of Berkeley life since I arrived here in the mid-’70s: lost pet posters (and all sorts of other fliers) on our local telephone poles. This one’s a little eye-catching. 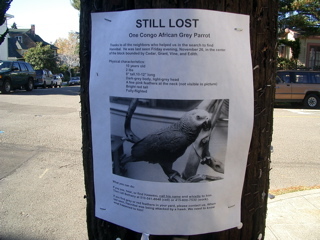 "Lost Congo African Grey Parrot." So we’ve got lost birds here pretty often, too. In fact, there’s a flock of feral parrots that sometimes makes an appearance in these parts. Lots of loud squawking and flapping and ganglike avian activity when they’re around. What interested me about this poster is what was going on when he vanished last Friday: "When last seen, Hannibal [editor’s note: the bird’s name] was being attacked by a hawk." Yes, there are some little falcon-like hawks around town that dine on some of less fierce feathered types. One evening when my brother John was out here, we were walking up the street and saw feathers floating to the ground. Atop a telephone poll, a Cooper’s hawk was pulling apart a morning dove it had just caught for dinner. Urban wildlife. You could probably pitch it as a subject for a community-access TV program.